Inquisitor is arguably one of the most solid, all-around souls in the game. It can be used in every aspect of the game and perform outstandingly. 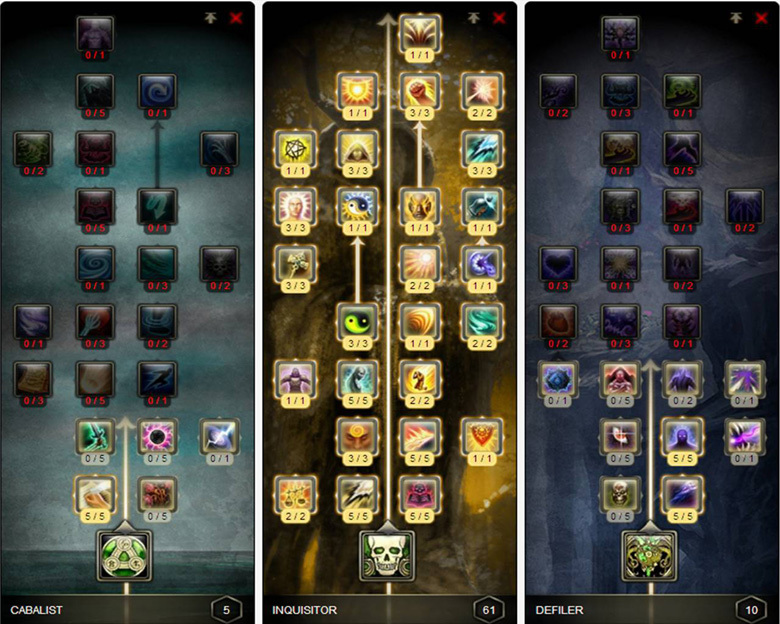 Whether you’re looking for a decent leveling build to quickly slice through mobs, mash out some serious numbers on the damage meters in endgame raids, dominate Warfronts with fast, hard-hitting bolts or go back and solo old content, Inquisitor has tools for every job! In this guide, I’m going to be showing you how to get the most out of Inquisitor in almost every scenario. There are two different variants of this build. Which one you use depends on the circumstances of each fight. They both slightly differ, but also bring different things to the table. Also, for players who haven’t purchased the Storm Legion souls and do not have access to Defiler, I’ve attached an additional spec that will play out the same but deal slightly less damage. 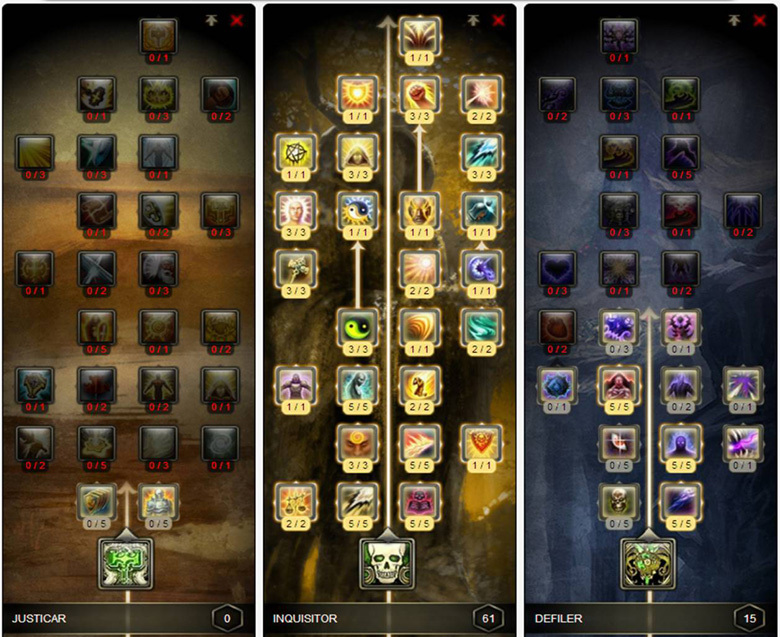 This is currently the highest damaging version of the 61 Inquisitor build. The problem with this build is that to get a higher output than the other variant, your health needs to be above 90% at least 80% of the time. This build also has the pros of having a dispel and additional self healing from Justicar on every attack. This makes it quite a strong and sturdy build for solo gameplay and soloing old content. 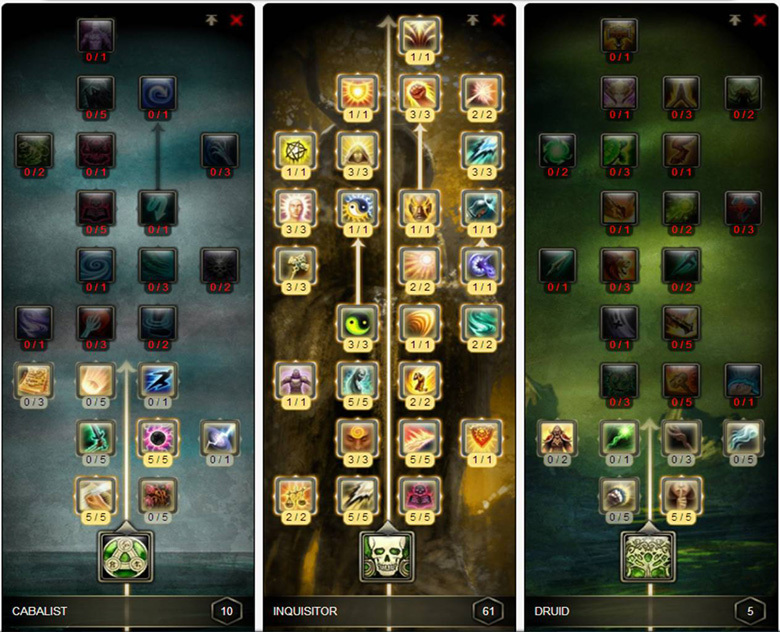 However, if you’re going to solo old content (raids for example), it is likely your health will be below 90% the majority of the time, so if you are using this build purely for soloing you can also move 5 points from Defiler to Justicar for 10% Endurance. This is the alternate build that you should use on fights with a lot of raid damage going out where at least 80% of the time your health is below 90%. The build opts out the 5 points in Defiler that provide a 10% damage increase when you’re over 90% for 5 points in Cabalist, which gives you 10% increased Wisdom. You lose both the dispel and the self-healing from Justicar with this build. You gain a few Cabalist abilities, but they’re all fairly useless and should be left out of the Inquisitor rotation. If you do not have access to the Storm Legion souls, this is the best build for you. Not having Defiler means that you’re losing out on both Rage Blight and Blighted Greed, which provide a 5% damage bonus. You will also not have the self-heal utility spell Loathsome Restoration or Marrow harvest for when you are facing away from a target. You will, however, get Shield of Oak, an off-GCD shield that provides a small damage reduction. Inquisitor has only one macro worth using which is combining Fanaticism with Bolt of Depravity. If you macro any other abilities, it will result in a DPS loss. The single target rotation is as simple as following the priority list above. The basic way to help this spec flow correctly is to ensure that you have all your damage over time abilities (Scourge, Vex, Sanction Heretic) on the target and then work on building 5 stacks of Life and Death Concord with Bolt of Retribution and Bolt of Judgement. As soon as you reach 5 stacks, you will want to cast a Bolt of Depravity. From then on it’s just as simple as following the priority list above. As a side note, usually after your first insta-cast Bolt of Depravity, your raid cooldowns are active so you will want to start the cooldown rotation as listed below. You want to make the most of Radical Coalescence, which expands your rotation a bit. If pulled off correctly, this will give you a huge boost to DPS. This looks complicated, but it’s only a few buttons really. You will notice your Soul Drain has a 10 second cooldown while Circle of Oblivion only has a 7 second channeled duration. This means there is a 2-3 second gap between using another Soul Drain after you’ve cast Circle of Oblivion. Use this time to quickly tab through and put a Scourge on the mobs with the highest health and then rinse and repeat the rotation. Seatin you crazy foo Y U no Ahov (Dark Water) guide? Ahov’s 61 Inqui spec relies on keeping up and maintaining 3 stacks of Dark Water and is only a very minor DPS increase (500-700). This is provided you never let the stacks drop and refresh Dark Water within the 1-3s of it falling off. As your DPS takes a bit of a hit initially, getting these stacks up makes it a sub-par build for any fights that last under a minute. If the stacks drop off or you are playing the build too safe and refreshing the stacks too often, you’re going to continually lose DPS. Gelidra: Add phase and target switching. You will either let the stacks drop off or waste time and GCDs trying to keep them up on a 99% damage immune Gelidra. Zaviel: Conduit Phase. You will either let the stacks drop off or waste time and GCDs trying to keep them up on a completely damage immune Zaviel. Twins: May be worthwhile provided your DPS is perfectly balanced. If, however, one is ahead (which is often the case), you’re either going to risk pushing one too far or lose your stacks target switching. Crucia: Tons of short, bursty add phases. Need I say more? Prog: Bursty target switching galore. Kain: Short, bursty add phases. May be better for DPS in the last phase. Matriarch: If you can manage to keep the stacks up on Matriarch while you are also burning the child, Ahov’s spec may be better! Goloch: Since it’s a straight up nuke, this is one of the fights that 10 Cab/5 Defiler– if played correctly– will beat 15 Defiler. Regulos: Target switching and platform phases galore. So, unless you have next-level Ahov skills, the spec this guide is suggesting will usually trump 10 Cab/5 Defiler. As always, please feel free to correct me on anything I may have gotten wrong. Does our initial kerran architecture style guide fit in with your ideas for kerran?